Puzzles are good time-occupiers when my children are weary of their usual set of toys. As we’re unschoolers, they also provide a good way of analysing my children’s learning styles and introducing problem-solving techniques that will prove useful for life. Children expand their minds when playing with puzzles, exercising visual and sensory perception, memory and logic. 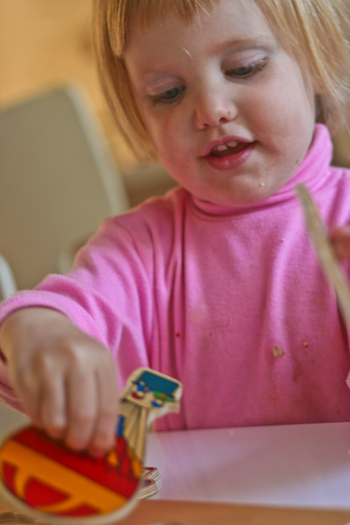 Puzzles promote fine motor skills and systematic thinking. They’re great value for educational purposes, and — despite the hype — so-called “educational” puzzles are not necessarily better value than ones with a fun picture. Keeping a puzzle collection is sometimes problematic, but if you address the underlying issues correctly, you can benefit from the people who don’t and thus get rid of the puzzles they have. Because those families don’t value puzzles highly, they’re often available very cheap in secondhand shops. Children approach puzzle-solving in different ways, and it’s useful to understand your child’s natural learning methods so you can encourage them in their natural inclinations and teach them the skills they’re missing. Early on, build a vocabulary to direct your child without actually doing the puzzle for them. I use words like “spin” to teach my toddler to rotate the piece until it fits in the slot. Jigsaw puzzles for older children are made of pieces that have “tabs” (male) and “blanks” (female) on them. Some children are highly tuned to the visual effects of the puzzle. They will be able to sort and find interlocking pieces by matching the colours. This is useful for puzzles with a simpler image but frustrating if the picture is very busy. Other children will focus on the finished product, trying to match each piece in their hand with the location on the picture. This can be frustrating if they aren’t successful in locating neighbouring pieces. Still other children will focus on the shapes of the pieces, trying to piece the puzzle together by identifying pieces with an unusual tab shape and then locating the matching blank in another puzzle piece. These children instinctively understand why the edge pieces are straight and often join the border of the puzzle first. But those who focus on colour or picture will need to be gently guided into this strategy if they are experiencing frustration while working on their puzzle. Just pointing out the different shapes of some of the pieces may be enough to give your child the clues they need to start matching more pieces together. Look for irregular tabs and funny peninsula corners. Show your child what they are looking for — a certain shape, a certain colour, or something that matches this position on the picture. Give your child the information they need and then sit back and watch which way they choose to proceed. Some children would love to have you reward each correct selection as they pick up a piece, but holding your praise until the child has successfully locked two pieces together gives your child a double reward — that of finding their own success as well as being acknowledged for their cleverness. Lastly, remember that some children are not focused on completing the puzzle. They’re happy to play with it for a while, successfully place some pieces and then move on. Even if your child doesn’t complete every puzzle, it doesn’t negate the learning or development happening while they are working on it. Obviously, you’d probably want to lead your child to finish what they’ve started, but don’t focus on this so intently that you take the pleasure away. Children’s puzzles have a short time-span in which they’re useful. In building a collection, you’ll need to have puzzles for each step of your child’s development. Build a collection that includes wooden drop-in pieces, board puzzles where the shape outlines are marked and regular cardboard jigsaw puzzles with a range of total pieces. If you miss the crucial time-of-interest for a puzzle, you’ll find that it’s useless because it’s too easy or discouraging because it’s too hard. For families with multiple children, puzzles are always a good investment because the puzzle that is too easy will soon be just-right for a younger child. If you’re not interested in building your own collection, many libraries hold puzzle collections for loan. Because children are individuals (which we can sometimes forget in all our comparisons), there will always be some who are advanced in their puzzle-building abilities. Others will lag behind their peers. Respect your child’s skill level and guide them to a puzzle that is right for their ability. Your child’s attention span plus their skill level is what will direct the puzzles that they can successfully complete. However, because most people want an indication of what is “normal”, the age guide on the side of the box is usually a good guide. My two-year-old does wooden puzzles that drop in to the corresponding shapes and simple 2-4 piece jigsaws. My almost-four-year-old has just started 48-piece puzzles, as the 24-piece ones were too simple. And my five-year-old has just moved onto 100-piece puzzles. This is just where our family is at. Others will be completely different. A good collection of puzzles mean that you’ll have puzzles for each age group in your house. However, many puzzles are hard to store and access. Sure, you can store them, but will they still be accessible by your children? And can they pack them away themselves? If you’re the one stuck with always packing away the puzzles, you’ll rapidly forget how valuable they are, and they’ll end up in your own pile of toys to give away. I can understand parents who unearth a pile of puzzles in the back of the linen cupboard and decide to give them all away because they’re never played with. A set of shallow drawers provides the perfect solution for storing and accessing puzzles. When Aisha was two years old, I realised what a nightmare the puzzles could become. We couldn’t keep them sorted and neat, accessible and stored away. Pieces were dropping out, getting lost, turning up in odd places and being carried away by the crawling baby. So I looked around, found this set of shallow drawers at Ikea, sold some household items to fund the ridiculous price (yep, I know it’s pricey). I have never regretted the purchase. The drawers are turned to face the wall when I want them in storage — so the younger children don’t open the drawers and play with the contents freely. However, the older girls know how to turn the unit around if they want to access the drawers. There are two depths of drawers in this unit, which means that I can store the shallow wooden puzzles in the top drawers and the boxed games and puzzles in the deeper drawers at the bottom. Occasionally I wonder if I could justify buying another set of drawers to use for storing our Playmobil (which worked wonderfully for a while, but I reverted back to using the drawers for puzzles), but I haven’t been brave enough to suggest it to David. If someone else has another idea for storing puzzles effectively, please share it! 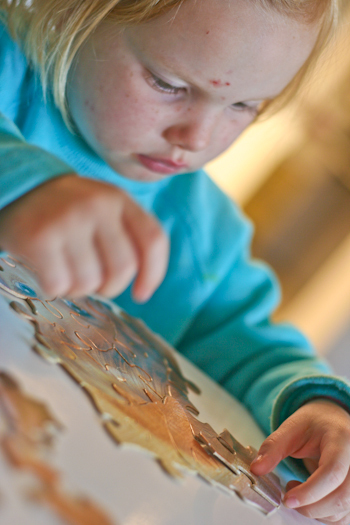 Even small children can help you complete complicated, “adult” puzzles. One piece here or there, conveniently left undone until a child finds it and places it, will empower your child and build a love for puzzles. Complicated puzzles are also a unifier where there is an age discrepancy. Once your children are aged eight or so, they should be able to work on 500-piece and 1000-piece puzzles alongside you and at about the same skill level. Likewise, a grandparent and a child can work alongside each other to solve a puzzle — communicating as equals as they unite to finish the task. And now, what are you waiting for? Next time you have a rainy day, dig out some of those puzzles and work on them with your children. When you have a quiet moment with another adult, bring out a grand puzzle and make a start. It’s fun, it’s a great way to stay mentally active, and it demonstrates the natural learning that you want your own children to mimic! Great post, we love puzzles here too, but I must admit we haven’t used them so much of late. I have become the, keep them in the cupboard because they make such a mess!!!!! But when B was 2 – 3 he was a puzzle machine, couldn’t get enough of them and frequently completed puzzles well above his years. We always taught/showed/explained to him the shapes and the details within the shapes and I think that helped tremendously. I need to go to Ikea so I will definitley be checking out that storage unit, it looks great. That Ikea set of drawers does look great but on a tight budget, I opted for large ziplock bags and the like to keep all pieces together and then they all went into a large storage box. They’re still there and dd does get them out at times to play with them…I think they need updating though to more challenging ones for her age! Puzzles have always been found scattered around our house, although now we have moved on to the big puzzles – often between 750-1500 piece puzzles. We often have one spread out on the table, or the coffee table, while our whole family works on it together, a little bit each day. And when people come to visit, they can’t help themselves, but absentmindedly pick up a piece or two to fit in. Sometimes they take us over a month to complete. I find puzzles especially great while I am reading aloud to my children. Keeps their hands busy, while their minds are quiet and their ears listening. Very helpful thoughts on helping children with puzzles. We love puzzles at our house too. It is usually an activity for us to work on together. I just store them on the shelves with a clue as to what each puzzle is written on the side (if there is no picture) and pull out a selection and put them on the table when we want to play puzzles.